What a brilliant idea! 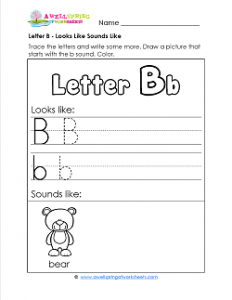 You can have your kids work on this letter b looks like sounds like worksheet. It’ll only take about 10-15 minutes and it’s great letter writing practice. Kids can write both the uppercase and lowercase Bb on the lines in their neatest printing possible. Then they can come up with a word that starts with the b sound – like baby, or bottle, or barn, or brain – and draw a picture of it. Color their picture and the bear and, voila, they’re done.